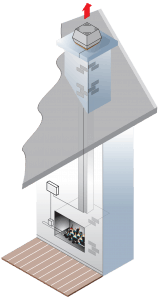 An Exodraft chimney fan is calculated on your bespoke chimney design. It will ensure that your Gas/solid fuel appliance will work efficiently, eliminating smoke and combustion fumes from within your room. An Exodraft fan is mounted on top of your chimney and ensures that your appliance will always work correctly no matter the weather conditions or location of your chimney. Ensuring optimal draught in your chimney allows you to start your appliance up quickly and provide a continuous, clean and efficient burn. It will also reduce the risk of ash and smoke being blown back into your room. Ask our team today for more information on having a bespoke fan sizing carried out for you.